The DeWalt DW618PK is a fantastic wood router overall. It’s easy enough to handle that nearly anyone can use it, but more than that it’spowerful, compact, and versatile. It will quickly become an indispensable companion for the burgeoning carpenter. A few months ago I found myself in the market for a new router, I’ve never been one to put much stock in brand names but I was convinced to give the DeWalt DW618PK a shot. Once I had it home and ready to go… well, the rest is history, and I’ve finally found myself a brand that I’ll gladly put a recommendation behind. As soon as I had it out of the box, I fell in love. This wood router is sturdy and well designed, and seemed pretty lightweight for the promised power output. I had been in the process of edging a cutting board for the kitchen when my old one died, so I transferred the bit over and got started as soon as I had it out of the truck and on the fixed base. It cut clean and smooth, and it fit extremely well in my hands. I used the fixed base first and played with the RPM settings a little bit to see how much extra control I could get over my previous piece of junk. Within only a few minutes of playing with it I was done, and I couldn’t wait to get started on the next project I’d be using it on. The dust collection system immediately improved my quality of life in the garage. I’d often used routers without that feature in the yard so that I could blow the saw dust onto the road, if I used one indoors due to the weather the amount of clean up was aggravating. It’s not perfect, but it did shorten my clean up time considerably. I spend a lot of time in my shop, and I do plenty of side jobs in there as well. The Dewalt DW618PK set made my life a whole lot easier with one simple purchase. The high horsepower motor and smooth RPM control made a believer out of me as soon as I used it and it continues to impress. One problem that might arise with some wood routers is a lack of consistency, I had always assumed it was amateur technique that did it to me. After investing in this one, I can safely say that the other routers might have actually been the problem, this one gives me consistent edging and grooving every single time I use it. It’s really user friendly as well, the soft start is a particularly nice touch as it doesn’t have a tendency to torque all the way up immediately. One of the nicer touches is the fact that the bases are quick release, so you’re able to change them quickly when the time comes. I do a lot of work that requires me to switch bases a couple of times a day, and something simple like this makes for a lot of saved time. The dust collection can’t be emphasised enough either. Wood routers are messy tools by their very nature, they pulverize a large amount of wood quickly and the dust gets absolutely everywhere. Once I hooked up my shop vac, I was simply amazed at how little dust gets around the workshop. I tend to use a lot of high-quality wood in my projects, and with that quality comes hardness and density. This router cuts through oak as easily as pine, which makes it perfect for people who like to produce high-quality woodwork for their homes or their business. The router seems durable, I probably use mine five or six days a week and it’s kept going like new since I bought it. I still have a few months left on the one year warranty that came with the purchase, but I don’t think I’ll be needing it. The depth control is simply fantastic as well, accurate to 1/256th of an inch. This makes for amazingly precise control when I’m working on something precise or artistic, I’m certainly not limited by the adjustment anymore. While I mostly use this one freehand, I have attached it to my router table a couple of times just to see how it does. It makes a great addition to the table, that’s for sure, but for the time being I have something a bit larger there as I only use it for really heavy duty work on most occasions. It is a great additional piece of functionality though. The actual design has one key feature which I didn’t even think about when I bought it. The motor is flat topped, and I can easily invert it and set it down on the bench when I want to adjust the height or change a bit. It may not seem like much, but it’s one of the things I love the most about this model. The handles aren’t the best in the world, but they’re definitely serviceable. They’re made of tough rubber, so you don’t get too much shock transferred to your hands. It’s a personal opinion, but while they’re comfortable I’d prefer some other material in my hands. There’s only a couple drawbacks to this router. The first is that it doesn’t come with a light, which doesn’t make a difference most days but it’d sure be handy at other times. The other problem is the fact that changing the basis seems to gouge the aluminium pretty badly. It’s just cosmetic damage, but for the price, I’m kind of disappointed that merely changing the base causes some scratching. This is a solid mid-sized router, and my complaints about it have nothing to do with its use as a tool. If you’re looking for something solid, with a great amount of power you’ll love the DeWalt DW618PK. If you’re just getting started in woodworking, don’t make my mistake either, this one is newbie friendly. As far as quality, reliability, and durability comes in, I’m massively impressed with this tool. If you need something for around the home or in the garage, make sure to pick up this high-quality router, you won’t be disappointed. 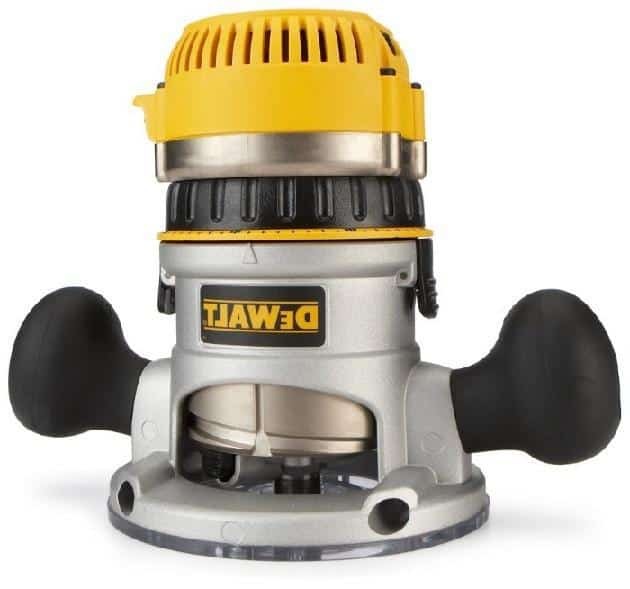 If you want to see another router in the same class of this one, DEWALT DW618B3 with an Additional Exceptional D-Handle Base is a good option for you.